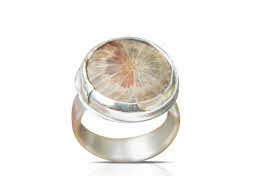 A real fossil Trilobite is set in a silver bezel on a solid silver ring. The ring itself measures 8mm wide. This width would suit a man more, but I also make a thinner ring with the Trilobite set sideways for a lady. These are made to order in any size. This process normally only takes a couple of days start to finish. Maybe a little more at very busy times like Christmas! The ring will be nicely boxed and labelled in a black velvet lined ring box. This is a new piece of jewellery and one that I think will be very popular! The ring itself measures 5mm wide. This is a thinner ring with the Trilobite set sideways. This is an exquisite little piece of jewellery. I have used these to set in silver and turn into a solid silver ring. These are made to order in any size. If you would like one, just order from here. I will contact you straight away and send you an image of the coral cabochons I have in stock. If you are unfamiliar with Ammolite then you are in for a treat. It is often called the rarest gem in the world. It is rarer in many ways than gold or diamonds. There is only ONE place in the world that Ammolite is found. This is a mine in Alberta, Canada. Ammolite is the shiny surface of a fossil ammonite, found deep in a mine. Due to its rareness and beauty people often pay thousands of pounds for Ammolite jewellery. it really is highly prized. Please do a Google search for Ammolite jewellery and check out the prices. I challenge you to find a cheaper ammolite ring than this! Ammolite has the most incredible shimmering surface. Especially under sunlight you will get an amazing rainbow effect as the light plays on the surface of the Ammolite. I set the ammolite cabochon in a silver bezel and set this into a simple silver ring. The cabochon can be round if you prefer. Just let me know when you order. I will contact you straight away and when you tell me your ring size I will make your ring to order and post it to you. If you don't know your ring size you can either go into a jewellers shop or I can post you a ring sizer. This process normally only takes a few days, start to finish. Maybe a little more at very busy times like Christmas! The ring will be nicely boxed and labelled in a black velvet lined ring box and also be sent with a signed certificate of authenticity. This is a sleek and elegant ring and the ring itself measures 3mm wide and has a D shaped curved outer surface and flat inner face so is very comfortable to wear. Just let me know when you order!